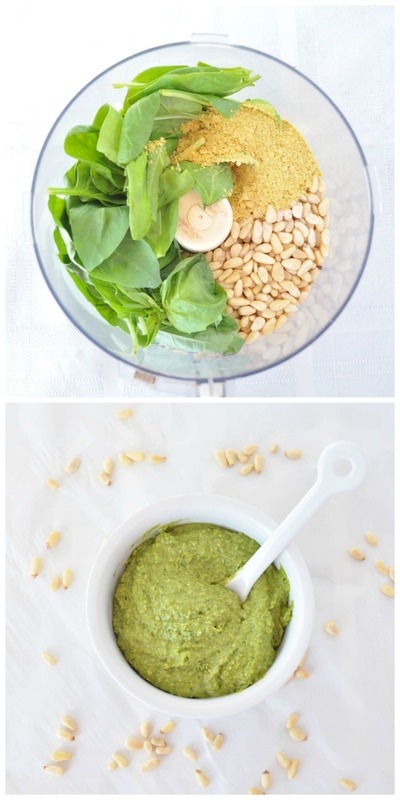 Dairy Free Pesto is the recipe for today! Pesto is one of my favorite sauces. It’s great on zucchini noodles and pizza. It also makes a great dip or sandwich spread. This healthy vegan pesto sauce is very versatile. It’s also super easy to make! I only used 6 ingredients. My dairy free pesto recipe is also oil free. If you like to make your own dressings and sauces, you may also like this post full of sauce and condiment recipes. You can whip up this healthy pesto in just minutes. I added spinach to mine, but kale or chard will work too. No need for dairy and oil in this recipe. I added the nutritional yeast for a cheesy flavor, but it actually will give you a nice dose of B vitamins too! 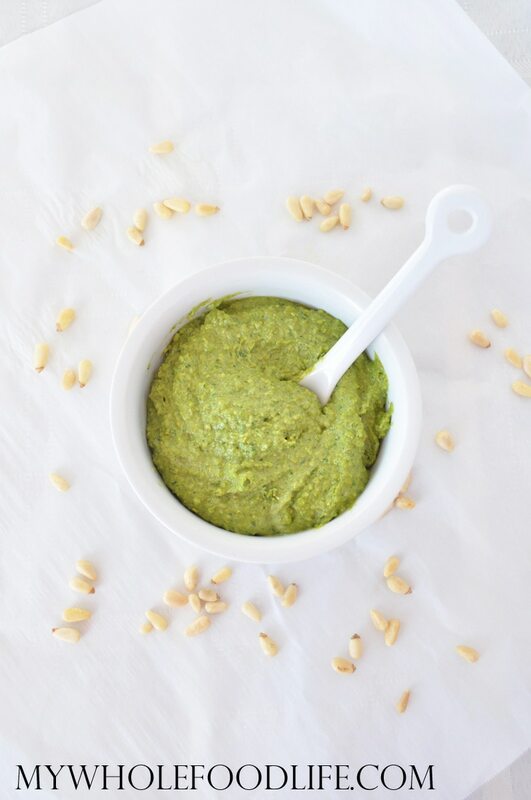 This dairy free pesto recipe is vegan, gluten free and grain free! You can keep it paleo, but omitting the yeast. If you are wondering what the heck nutritional yeast is, check out this post. In a food processor , combine all the ingredients. Once everything is well mixed, slowly add water and keep processing until you reach a desired consistency. This pesto should last 4-5 days in the fridge. You can also freeze it for longer storage. Enjoy! This looks yum! Do you have the calorie and nutritional breakdown? Thanks! Thanks Dee! I'm sorry I don't, but you can probably plug it into My Fitness Pal for a rough estimate. Never used nutritional yeast in pesto before.. definitely curious to know how this dairy free version tastes in comparison to regular pesto. Thanks for the recipe! Nutritional yeast in pesto is a great option for those who don't eat dairy. I hope you enjoy my version! This sounds awesome, and I love that there is no oil! Can't wait to try this, thank you! Always looking for oil-free recipes. Will try this recipe tonight. Thank you! You're welcome Heather! I hope you enjoy it. Sounds yummy! Do you know if the nutritional yeast has a cheesy sort of flavor to it since it's often substituted for cheese in recipes? I have a friend who isn't vegan but hates cheese so I can never make her pesto! Yes is does have a cheesy and nutty flavor. It is often used to replace cheese in vegan recipes. People either love it or hate it. What is the significance of being oil free? I can understand not using vegetable oils, please explain. I just try to limit oils. I eat a lot of nut butters and avocados and get healthy fats that way, but I don't want to overdo it. Yum! This pesto is SO tasty and I was really surprised! I've been trying to find a good healthy pesto recipe as I transition to more of a plant-based diet. I mixed it into some quinoa and spinach and topped with sun-dried tomatoes. Incredible! I think my son's going to love it. Thanks for posting this! This is so delicious! I've made it with pine nuts and walnuts and both are great. It freezes very well too. Thanks for sharing this easy, healthy recipe. OMG I just made this and it is out of this world.